The Procter & Gamble Company (PG): Is It on the Road to Recovery? On Wednesday, The Procter & Gamble Company (NYSE:PG) will release its latest quarterly results. The key to making smart investment decisions on stocks reporting earnings is to anticipate how they’ll do before they announce results, leaving you fully prepared to respond quickly to whatever surprises inevitably arise. That way, you’ll be less likely to have an uninformed, knee-jerk reaction that turns out to be exactly the wrong move. One of the peculiarities of the Dow Jones Industrial Average‘s bull run is that many of its more defensive components have participated in the rally. Procter & Gamble has soared to new highs recently as investors have overlooked some of its shortcomings and gravitated toward its healthy dividend yield and reputation for stability. Let’s take an early look at what’s been happening with The Procter & Gamble Company (NYSE:PG) over the past quarter and what we’re likely to see in its quarterly report. How will Procter & Gamble fare this quarter? Analysts have become more bullish in recent months on P&G’s earnings prospects, raising their estimates for the most recent quarter by a penny per share and boosting their full-year fiscal 2013 EPS calls by $0.08. The stock has performed impressively, rising 17% since mid-January. The Procter & Gamble Company (NYSE:PG) has taken a big step forward this quarter. Until recently, investors worried about P&G’s lack of strong growth, blaming a lack of innovation for the company’s lagging behind competitors. Unilever plc (ADR) (NYSE:UL) has managed to grow its revenue at a 7% annual pace over the past four years, while P&G has posted growth at only a third that pace over the past three years following a revenue decline in fiscal 2009. Yet last quarter’s unexpected sign of strength turned the stock around. Core earnings grew by double-digit percentages as lower costs and product price hikes added to the positive impact of rising sales volumes and market share. 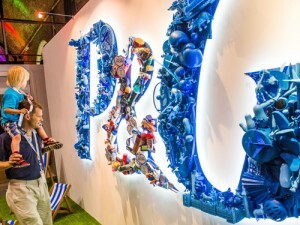 Moreover, with P&G expecting to release new products in the second half of 2013, investors hope innovation will return and help the company sustain its growth. One sign of strength for The Procter & Gamble Company (NYSE:PG) is its continuing streak of rising dividends, which the company extended earlier this month when it boosted its payout by 7%. The increase marked the 57th consecutive year that the company raised its dividend.